Below I’ve posted an article I wrote for The Lady magazine some years ago. Just to update it, I have seen redwings most winters in the tree – and the hawthorn continues to bring me good fortune and success. 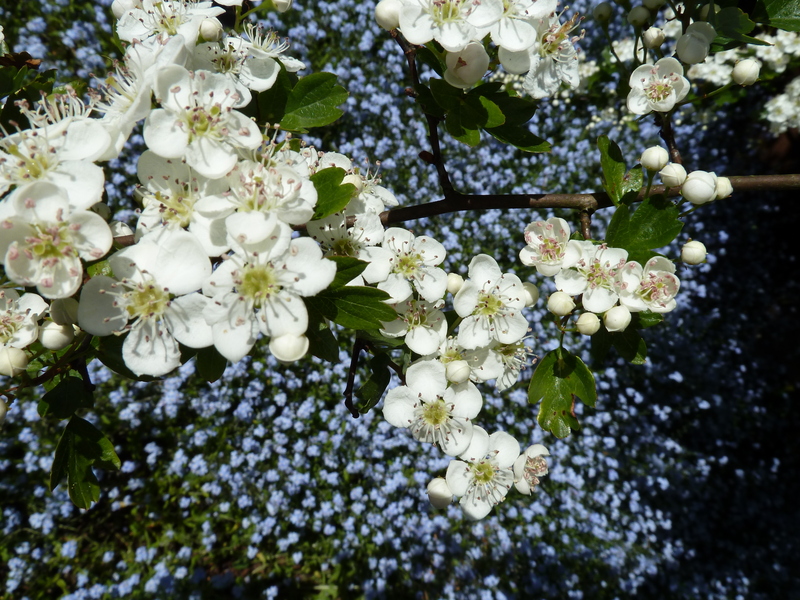 “Cast not a clout ‘til May is out” goes the old saying, though it is not the month of May, but rather the May Tree or Hawthorn to which it refers. When I moved into the house where I live now it was December and I was unsure what the trees at the bottom of my garden were. But with the coming of Spring they blossomed into a frothy white mass and there was no mistaking the intense scent of the crataegus monogyna or common hawthorn. The hawthorn is one of our most successful native trees. It colonises abandoned grassland and is known by many names including quickthorn, whitethorn as well as may. The tree is quick growing and long lived. It can grow to 30 feet high, but it is commonly used for hedging, its sharp thorns making it thick and impenetrable. 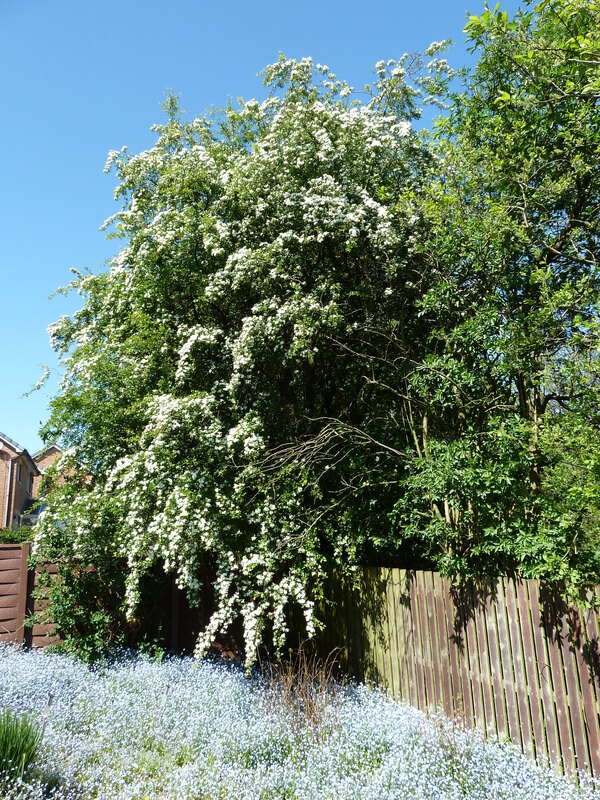 The white blossom which flowers in May and June marks the end of any cold weather and so it is safe to ‘cast a clout’, or put away your warm winter underwear, when it appears. The smell of the blossom is almost overpowering. Some say it smells of musk and has sexual connotations. Others think it has a slight scent of decomposition. Rural villagers in the middle ages thought that it held the smell of the Great Plague of London. The reason for its strong scent is probably that the flowers are fertilised mainly by carrion insects, who would normally lay their eggs in rotting flesh and the tree has acquired a whiff of that smell to attract them. The leaves, flowers and berries, which are bright red and can be seen from September, can all be used as a medicinal herb. Hawthorn is used to treat heart problems and it has been medically proved that the berries do reduce high blood pressure. When burned its wood gives the hottest of fires, but it is the mythology and legend which surrounds this tree that make it most interesting. Because it flowers in the Spring it is associated with fertility. Hawthorn was traditionally gathered on May Day. When you read about medieval knights and ladies riding out “a-maying” on the first morning of May, the practice refers to the custom of gathering flowering boughs of hawthorn to decorate the halls and May Poles. It was also an important part of the decoration for Spring weddings. Yet if you place it leaves under a pillow or scatter them around a bedroom it will enforce or maintain chastity and celibacy. Hawthorn is associated with both good and bad luck. A branch of hawthorn over your door will ward off evil spirits. Hawthorn will also protect you from lightning and protect your house from damage by storms. But do not bring the flowers into the house or someone who lives there will die. But if it is worn, or carried, it will promote happiness in the troubled, sad or depressed. Fishermen should also carry some hawthorn to ensure a good catch. There is also a legend that hawthorn was brought to this country by Joseph of Arimathea. Weary from his travels he rested his staff in the ground, where it took root and blossomed as the ‘Glastonbury Thorn’. A church was built on the site and this hawthorn is reputed to have blossomed at Christmas time to celebrate Jesus’ birth. It is told that cuttings from the tree were distributed all over Britain and still flower at Christmas, although the present hawthorn trees at Glastonbury Abbey are thought to be from a cutting of the original, which was hacked down on the orders of Oliver Cromwell during the English Civil War. At one time hawthorns were thought to be witches who had transformed themselves into trees. It was believed that witches danced and performed rites under the hawthorn and that they used the branches to make their broomsticks. It is also associated with fairies, especially in Ireland. The hawthorn is sacred to fairies and is part of the fairy tree triad of oak, ash and thorn. Where all three trees grow together it is said that you may see fairies. But bad luck will follow if you dare to disturb a ‘fairy thorn’. In 1982, workers in the De Lorean car plant in Northern Ireland claimed that the business had so many problems because a ‘fairy thorn’ bush had been disturbed during the construction of the plant. Apparently this claim was taken so seriously that a new bush was planted, with all due ceremony. I believe that my tree has brought good luck. It has certainly brought me a lot of pleasure. A pair of magpies nest safely amongst the thorns and many other small birds use it for cover, to eat from a birdfeeder hanging from one of its lower branches. In the autumn, the red berries attract blackbirds and also provide food for visiting redwings and fieldfares, though I have never been lucky enough to see any. Neither have I seen any fairies. But I enjoy watching it change with the seasons and I have been happy and successful since I came here.